Our lead facilitator, Moira McDade is highly skilled in the art of complex process facilitation, she works with both flexibility and rigour to achieve outcomes efficiently. 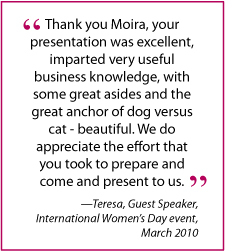 Moira has the unique ability to combine deep respect for every person in the room with rigorous and courageous management of group process and behaviour. Workshops—seeking the resolution of complex issues. Smart Service Queensland engaged The Generation Business to gain agreement amongst a diverse group of government agencies on the right mix of delivery channels to provide integrated customer service transactions. Conferences. The Generation Business specialise in staff conferences. We help design and deliver single or multi-day events that bring together staff for professional development, new products or services, or the introduction of major changes in structure, systems or processes. 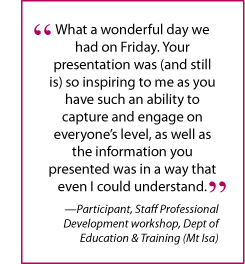 We designed and facilitated the Queensland Government Agent Program (QGAP) staff conference with 80 staff from a range of agencies across Queensland to inform them of new/changed products, services and systems as well as required professional development and peer networking. Meetings. The Generation Business is experienced in the simple, efficient and objective chairing of meetings of all sizes. We recently worked within the small community of Bangalow to support people to make decisions on volunteer resource requirements for the production of their community magazine, The Bangalow Heartbeat. Events. Moira facilitated a complex planning event for the future implementation of a light rail system on Queensland's Sunshine Coast. Participants included mayors, town planners and senior government representatives from many Queensland Government departments.